The Saudi Arabia-led coalition is using US-supplied cluster munitions in its airstrikes on Houthi forces in Yemen, Human Rights Watch reported. Targets include those close to villages, posing a threat from undetonated submunitions to civilians. 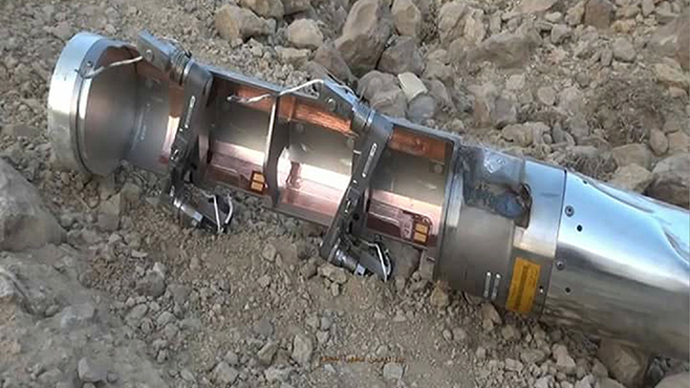 In recent weeks the coalition has used cluster bombs in Yemen’s northern Saada governorate, a region bordering Saudi Ararbia, which is historically controlled by the rebels,HRW said. Cluster munitions contain hundreds of smaller explosive submunitions that are spread over a wide area. This type of weapon is dangerous because some subminitions aren’t immediately detonated and can lie dormant for decades before exploding. Civilians and particularly children have been historically the primary victims of such booby traps. HRW says it received photo and video evidence as well as eyewitness accounts of the coalition using cluster bombs in its air raids on Houthis. In one case, they appeared to land on a field within 600 meters of several dozen civilian buildings. “We do not know why in this instance they've used the munitions. They did it before in 2009 and at that time we had no understanding of why they did that,” Belkis Wille, Yemen and Kuwait researcher with the HRW, told RT. “Locals in the village where the photos were taken of the munitions on the [ground] said they were suspecting that Saudi Arabia was trying to bomb a main highway that goes form the city of Saada, which is the Houthi stronghold in the country, southward in the direction of the capital Sanaa. We have not been able to verify that unfortunately,” she added. The organization identified the weapons used as CBU-105 Sensor Fuzed Weapons manufactured by the Textron Systems Corporation. It’s a 450-kilogram bomb containing 10 BLU-108 submunitions, which are dispersed in the air, are parachuted down. They then disperse smaller submunitions that detect armor vehicles like tanks and APCs and destroy them from above. A video of what HRW believes to be deployment of two CBU-105 Sensor Fuzed Weapons on April 17 was uploaded on a pro-Houthi YouTube channel. Saudi Arabia agreed a contract with the manufacture of the weapons in 2013, HRW said. The UAE received a number in June 2010 under a contract announced in 2007. Riyadh denied using cluster munitions in its Yemen campaign on March 29, a few days after it started.